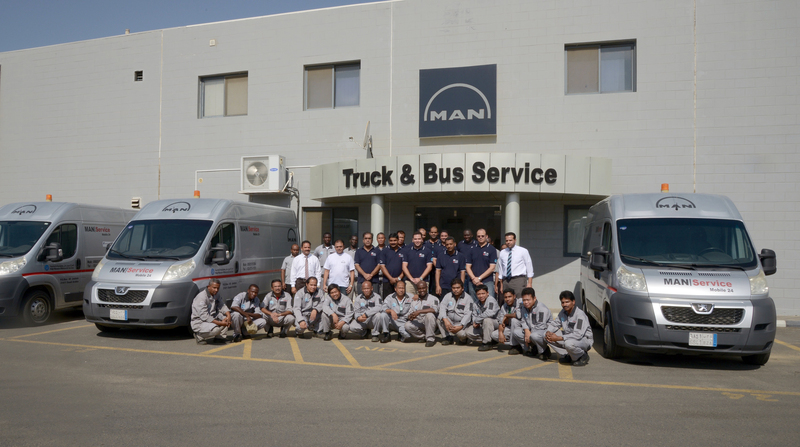 The Jeddah workshop of Haji Husein Alireza & Co. LTD, MAN Truck & Bus’s importer in Saudi Arabia has won MAN’s Service Quality Award for 2015 thereby being recognised as the best service centre in Middle East and Africa. It won the award while competing with 54 other workshops from across the region to showcase their potential and be worthy of MAN’s Service Quality Award which focuses on team performance, professionalism and quality. The objective behind the Award is continuous improvement of service quality and the associated increase in customer satisfaction. Besides being awarded best workshop in Middle East and Africa, the MAN workshop in Jeddah is among the 10 best workshops worldwide competing with 799 workshops. As part of the Service Quality Award competition, workshops were required to demonstrate their knowledge of vehicle technology online over several rounds. The best workshops from each region then travelled to Munich for the final. In the final, judges had 20 minutes at each station to assess participants' specialist knowledge of original parts, customer management, service agreements and warranties. In addition to this, the judges also had 40 minutes to evaluate their skills in rapid problem-solving on trucks, buses and engines at the practical stations. The Service Quality Award has been presented by MAN to the best team since 2008.